World darts champion Rob Cross made it back-to-back Unibet Premier League wins by defeating a five-time world champion tonight (Thursday). The St Leonards-based thrower followed up his 7-4 victory over Peter Wright in Newcastle last week with a 7-3 success against Raymond van Barneveld in Berlin. Cross recorded a 96.46 average, hit four 180s and had an excellent 70 percent success ratio on his doubles as he won the final four legs in front of 12,000 fans in the German capital - a post-war record for a darts event. Dutch great van Barneveld finished 78 in two darts to break throw in the opening leg, but Cross landed two 180s to break back in 14 darts and then checked out 96 in two darts to lead 2-1. Van Barneveld finished 72 to level at 2-2 and although Cross produced a 13-darter on his own throw in the next leg, van Barneveld nailed a 112 outshot to make it 3-3. Cross took charge thereafter, though. After hitting 52 in two darts to lead again, his third 180 followed by a two-dart 56 finish made it 5-3 and at that stage Cross had hit five of his six attempts at a double. An off-colour van Barneveld missed six darts at a double to break back in leg nine and Cross, after his final 180, landed double 10 to go within one of victory. He then finished the job in style with a brilliant 128 checkout for a 12-darter against the throw. In his post-match interview with Sky Sports, Cross said: “We’re feeling more and more comfortable. I have to admit it was the biggest crowd in darts and I never really noticed. 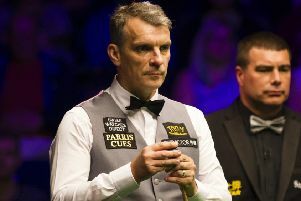 World number three Cross is up to fifth in the 10-man Premier League table, despite heavy defeats in his opening two matches against Michael van Gerwen and Simon Whitlock. The Premier League - a 16-week roadshow event - will move on to Exeter next Thursday night, when Cross will face two-time world champion and world number four Gary Anderson.